Easthampton MA did its version of the cow art contest with two sizes of fiberglass bear. This is a small one. Other creative bears can be seen at Easthamptonbearfest.com. 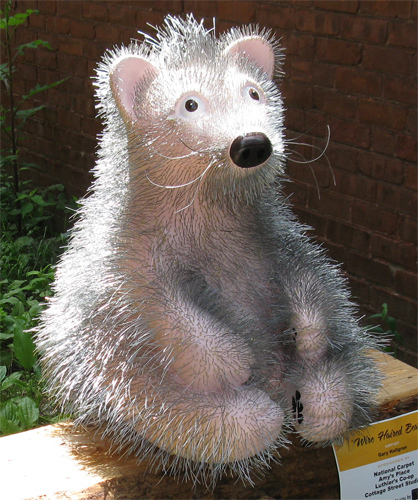 Some bears were subjected to kidnapping, but no one came near this porcupine. It was actually displayed behind an iron fence to protect small children and fools. At the end of the summer display the bears were auctioned and I am proud to say this guy fetched a decent price. Fiberglass reinforced resin, enamel, Gorilla glue and various gauges of galvanized and annealed wire.